Step - defines the grouping interval. It is a double property with default value 100. You may also create a PropertyGroupDescription instead of DoubleGroupDescription - this way the numeric data will be treated as a string and will be grouped and sorted as such. However by using PropertyGroupDescription you will loose the grouping interval feature of the DoubleGroupDescription (the Step property). 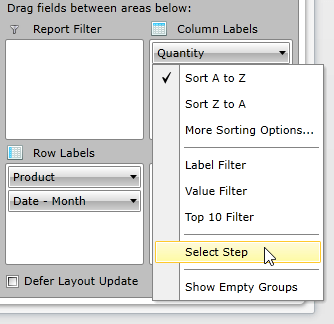 With the Q1 2015 release version of UI for Silverlight, the Step of each DoubleGroupDescription can be also customized through a dedicated UI dialog. The dialog is accessible through the context menu of each DoubleGroupDescription.